In June 2017, the San Pedro Waterfront Arts & Cultural District formed a partnership with Angels Gate Cultural Center, the Cabrillo Marine Aquarium, the CD15 Office of Joe Buscaino, the Grand Vision Foundation and the San Pedro Chamber of Commerce and were named as a California Cultural District by the California Arts Council. Over time, many artists of all disciplines, as well as 90 unique cultural assets claim San Pedro as their home and are vital to the community’s civic life. San Pedro is honored to be one of 14 Cultural Districts in the state of California and is actively participating in the two-year pilot program. 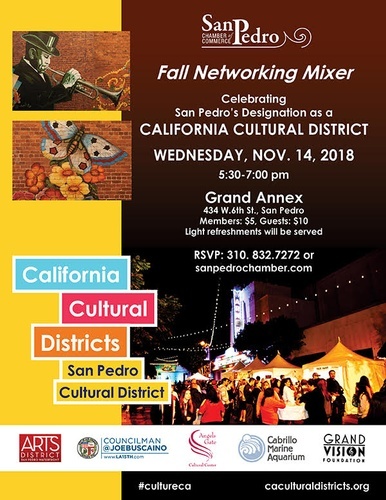 Since its inception in 2009, the Arts District’s mission is to promote San Pedro’s authentic arts, cultural and entertainment character through its varied advocacy, marketing and public education activities. Our public art projects have employed professional artists to paint three large scale murals, 24 DOT boxes and a small mural at the new Gaffey Street Del Taco location.